Whether you’re expanding your business or planning to kickstart your very first company, planning is one of the most important phases to keep in mind especially when computers and technology are involved. IT is one of the most costly expenses in business and if you’re not prepared for the costs and other concerns, then you’re going to be caught off guard by the costs of not just the hardware, but also the price you pay for software, repairs and other networking components. In order to help you prepare, we’re going to list some of the important reasons why you should always think and plan ahead when it comes to your IT infrastructure. You’re always going to get better deals if you’re able to purchase large quantities of computers from a wholesaler. This will save you a huge chunk of money that can be put towards other expenses in your business. However, in order to purchase in bulk, you’re going to need a rough understanding of how many computers you’ll need. This isn’t necessarily equal to the number of employees you have. Sometimes, you’ll need extra computers to serve different purposes such as powerful computers for image or video editing purposes, small computers to act as access points to your network or even laptops to use for remote working. Sometimes, people can make do with the warranty and assistance they get from the manufacturer or company they buy computers from. However, an IT help desk and support service will be of great service to you if you decide to purchase without extra services or if you decide to purchase second-hand equipment from an auction or a retailer. A major problem with poorly thought out infrastructures is that there’s no room for expansion. 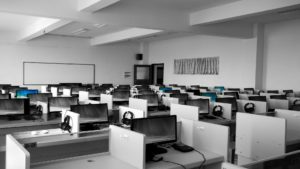 Whether it’s because you lack the physical space or because you’re not thinking about scalability, it’s important to plan ahead for the growth of your IT system as well. A good example of this is if you plan to increase the number of users on your network. This is a concern even if you work in a brick and mortar business. Network routers only have enough space for a certain number of users until you’ll start to experience slower speeds. As a result, you’ll need a network setup that can maintain consistent connections so that you and your employees never experience poor network service. Failing to plan ahead will easily result in extra issues such as replacing expensive equipment at inopportune times or wasting your money on cheaper solutions that will ultimately be replaced. ← Don’t Let These Small Mistakes Drag Your Business Under!